Health Secretary, Vaughan Gething, has announced £1.2m to improve the renal dialysis unit at University Hospital for Wales (UHW), Cardiff. 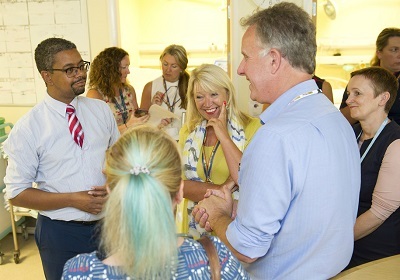 During a visit to the unit today (Thursday, 19 July), Mr Gething saw how the money will be used to upgrade the unit to deal with patients in a more clinically appropriate environment and improving their overall experience. He said: “Chronic kidney disease is estimated to affect 6‐8% of the general population. With many of the contributing factors, age, obesity‐related diabetes and coronary heart disease, expected to increase, the demand for renal services is set to grow. The new design has been clinically led to produce a unit designed to meet the specific demands of about 20 – 25 highly complex patients who not only require regular dialysis, but who also need key multidisciplinary input from the many specialties that are based within UHW. The development together with the Renal Ward (B5) and the Transplant unit in UHW will enable the health board to deliver more efficient treatment of patients with severe acute kidney injury, as well as other patients within UHW that require regular dialysis as inpatients. Catherine Wood, Directorate Manager for Nephrology at Cardiff and Vale University Health Board said: “We are extremely pleased to receive this investment in our services. “Suite 19 is the main renal unit within the UHW hub and treats patients with a broad range of needs including those with complex medical or nursing needs.